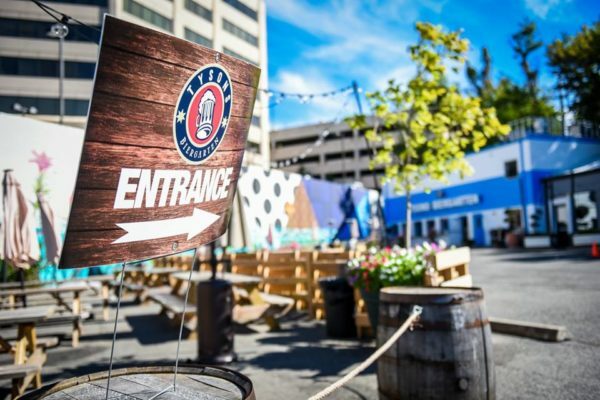 It’s been a long time coming, but plans are being finalized for the Tysons Biergarten’s move to a new interim location at the McLean Metro station. Cityline Partners LLC is scheduled to present its plans for the next stage of the Scotts Run development at a Fairfax County Planning Commission meeting on Thursday. The plans include two office towers and one residential building. Before those buildings are developed, however, Cityline is asking that the site be used as a beer garden and an open lawn. Tysons Biergarten is currently located near the Greensboro Metro station with a month-to-month lease. The location has always been a temporary fill for the planned Tysons Central development at the site — part of the broader Boro complex — but has become a local nightlife destination. In addition to the Biergarten, a small plaza with a kiosk is proposed outside of the biergarten entrance manned by a person to help oversee parking. The application specifies that the structures and interim uses are not permanent. In 2013, the Board of Supervisors approved Cityline’s plans for a mixed-use redevelopment with hotel, office, retail and residential uses across 5 million square feet. How long the Tysons Biergarten would be located in this space before development begins is currently unknown. After review by the Planning Commission, Cityline’s proposal will move forward for approval by the Board of Supervisors.